Instagram ads are a great way to reach those outside your own following and many use them in hopes of reaching influencers. 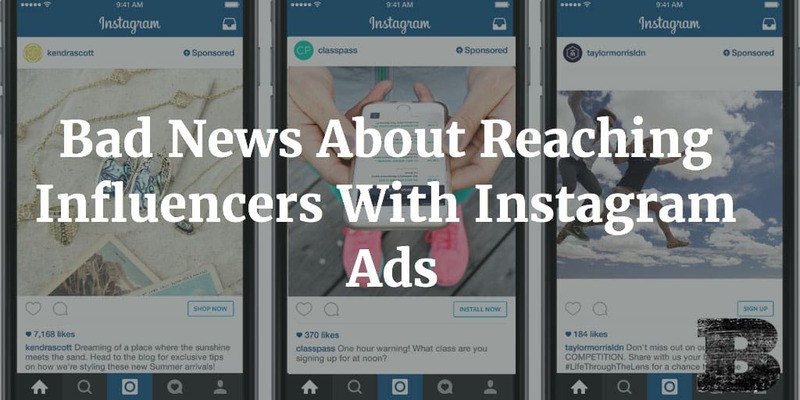 But what Instagram hasn’t made clear is that most influencers don’t see Instagram ads. Though I’ll be the first to point out that people with large followings are not automatically influencers and many real influencers have small followings, let’s ignore that for a moment. Instagram accounts with large followings are not shown ads. That’s right, if you have more than about 10-15k followers, Instagram doesn’t show you ads. This is something I’ve noticed with a number of my Instagram accounts, and others have confirmed that they too don’t ads in their timeline. This may be a move that Instagram has made to keep their influencers happy but it’s not helpful to those looking to reach people that can influence large audiences. Even if those with large followings did see promoted posts, there’s still another problem. Unlike other social networks, Instagram doesn’t allow the same level of ad targeting. Where you can target ads at just those with large followings or other specific attributes, Instagram promoted posts don’t allow that level of granularity. Their targeting options are built around Facebook ad targeting, which is much more like LinkedIn in nature than Twitter, which Instagram more closely resembles. This lack of following targeting means that you can’t hit just those with large followings or anyone with any degree of certainty. Instagram promoted posts are just as likely to be shown to someone with 1 follower as they are to someone with 1,000,000. Until the targeting changes, it makes being seen by influencers a very hard task. Even if you were able to fix targeting problem and make influencers see ads you still wouldn’t be home free. Social media paid reporting leaves a lot to desire about who actually saw your ads. We get plenty of numbers around how many (like how many link clicks, engagements, impressions, and more) but very little about WHO those people were. This is done to protect the privacy of those that engage, but it also prevents us from knowing who engaged with our ads and keeps us from seeing that we’re hitting our mark (we can hope to find some of this information within our own website analytics but it’s still a tough task to determine if we’re hitting those we want). It’s clear that targeting influencers on Instagram through promoted posts may not be the way to go, but that doesn’t mean that the site isn’t worth your time. There are still many ways to connect with influencers on Instagram, such as sharing relevant content, tagging them, engaging with them, and using it as an identification tool. By being aware of how we can and cannot engage influencers, we can build programs that better connect with those we’re looking to engage. Be aware of the ups and downs of influencer engagement and you’ll be ahead of the crowd. Now that you know how you can’t, take a look at the many ways you can engage the influencers you want.